Christina Zaitsev and Ernie Utah Stevens perform their Long Program at the 2013 US National Figure Skating Championships. 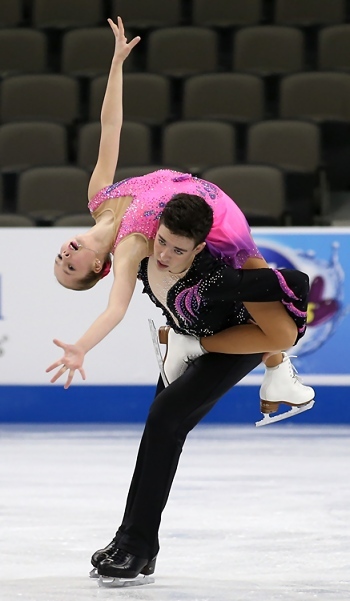 The novice pairs took to the ice on Monday afternoon for their free skate, and when the competition was over, it was 13-year-old Christina Zaitsev and 19-year-old Ernie Utah Stevens who came away with the crown at the 2013 Prudential U.S. National Figure Skating Championships. Fourth a year ago, Zaitsev and Stevens had the unique opportunity to compete on the Junior Grand Prix circuit earlier this season, and the experience showed. Skating to Bach’s Toccata, the duo executed two double throws—loop and Salchow with ease, and demonstrated a polish that the other teams were not able to show. “We felt like novice would be more stable this season, and then try our best at junior next season,” Zaitsev shared. The champions scored 123.30 points in the competition, overtaking the short program leaders Kaitlin Budd, 16, and Nikita Cheban, 20, who settled for silver. Early in the program, Budd fell on a solo double Axel attempt, giving the team some cause for concern. “I think my shoulder kind of popped out a little bit, so I thought, ‘what am I going to do’, but I just kept going,” Budd said of the fall. The silver medalists skated well after the mistake, even landing the only throw triple of the event late in their Ice Symphony program, en route to a total of 114.71 points in the competition. The bronze medalists were Elise Middleton, 13, and Robert Hennings, 16, who gave the audience a scare on their final element—an overhead lift that ended with Middleton nearly falling on top of Henning’s head. Before the error, Middleton and Hennings presented a polished program to Immortal Beloved, and scored a total of 109.85 points. Finishing in fourth place were Aya Takai, 15, and Brian Johnson, 17, with 102.71 points. Sophia Dai, 13, and Jeffrey Fishman 17, followed in fifth place with 100.62 points, while Grace Knoop, 12, and Noah Chinault, 17, finished in sixth with 90.43 points.